Acouphènes is as much an ecological fable as an experimental nursery rhyme. 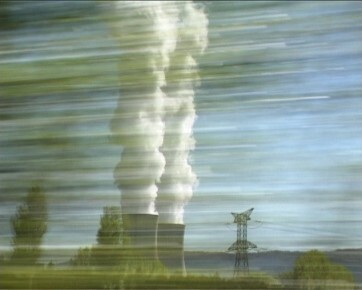 Under an ironic exterior, this short film sounds out our confidence in nuclear power. It all begins with the recollection of a journey during which the narrator, then a child, questions his parents about the big chimneys along the side of the motorway. Become an adult, the film maker decides to investigate. Here he is at Pierrelatte, a charming village home to the nuclear site of Tricastin. So far, all is well! 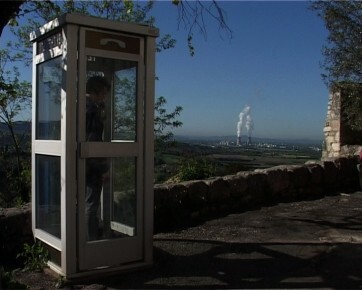 From a cabin, he telephones the 'communication division' of he power station to find out what are the risks of danger. They assure him that the ingeneers are 'responsible and qualified people who rarely make mistakes'. One has to admit, he acknowledges 'that a car accident is far more dangerous than a power station that has no accident'. In the same vein, he talks to a lady chemist who confirms that the iodine tablets distributed free of charge only protect his thyroid gland from radiations. For the rest, he only has to follow the instructions of the authorities... 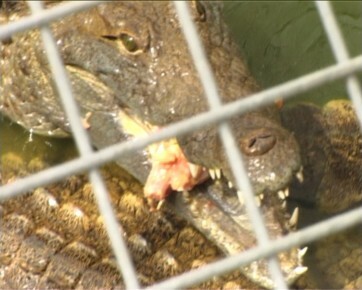 Being unable to visit the site because of the terrorist threat, he finishes his tour at the 'crocodile farm' where the heat comes from the cooling circuit of the power station. With a sound track in form of a nightmare, the director confers a quasi apocalyptic dimension to his inquiry.